Handoff in macOS and iOS lets you move activities between devices. In this article, we show you how to set up, use and troubleshoot it. Recently we showed you how to set up the new feature in Windows 10 called Continue on PC for iOS and Android. 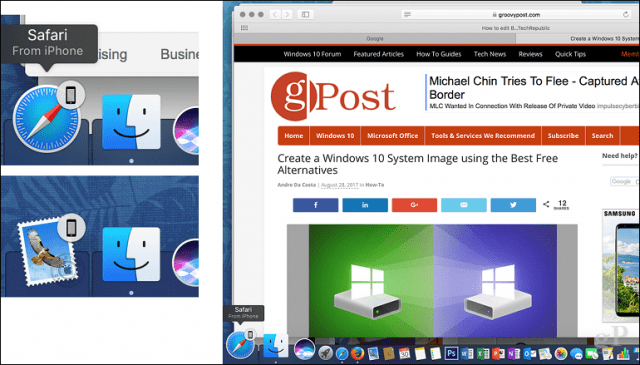 Mac users have been enjoying a similar feature for quite some time called Handoff. 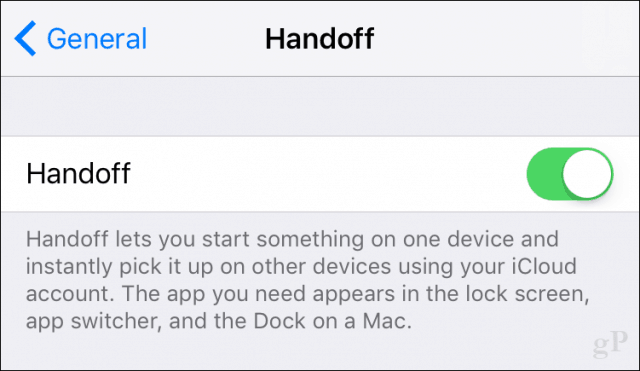 Handoff is a family of services that lets you easily move and share activities between your Mac and Apple devices. Want to finish composing an email you started on your iPhone on your Mac? Or even take a call from your desktop? Handoff lets you do that. Let’s check it out. How does Handoff work? The ingredients are quite novel: Bluetooth and your iCloud account are all that you need. Your Mac should be running a minimum of OS X Yosemite, version 10.10 (sorry, no Windows support) and the latest version of iOS on your Apple devices. 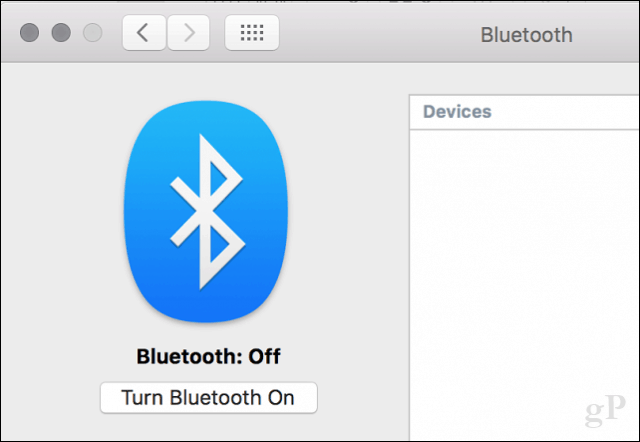 Apple also requires at least Bluetooth 4.0 LE in order to use Handoff. Of course, none of this would be possible without the Internet since it’s the glue that brings it all together. In macOS, open System Preferences, General, scroll down then enable Allow Handoff between this Mac and your iCloud devices. 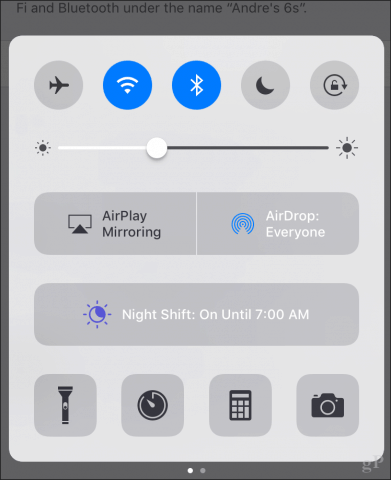 In iOS, open Settings, General, Handoff, toggle on Handoff. In macOS, open System Preferences, Bluetooth, enable Bluetooth. Supported applications vary, but Apple says the vast majority of the built in apps in macOS and their iOS equivalents support Handoff. I was able to get a few to work such as Mail and Safari but support for others seemed to be theoretical still. For instance, universal clipboard – which lets you copy content from another device into macOS apps – wouldn’t work no matter what I tried. So, your success can be hit or miss. 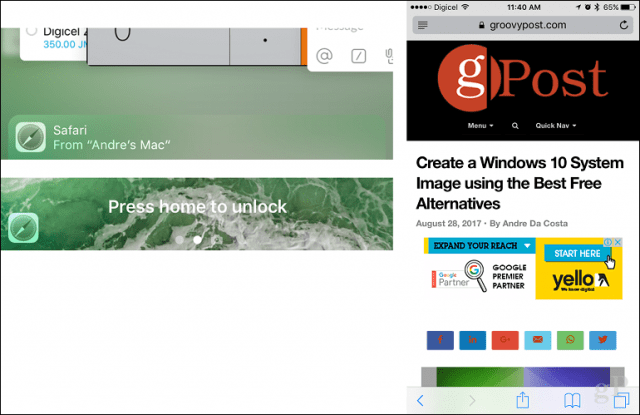 In order to use Handoff, from your iOS device, double press the Home button to bring up the multi-tasking view. At the bottom, you will see an app notification indicating connected devices. To hand off a web page to your iOS device, just tap the Safari notification, and automagically, the web page will open in Safari, and you can pick up from where you left off on your Mac. If you are using a Mac and would like to hand off a task from one of your iOS devices, then you will see an icon appear to the left of the Dock with a phone emblem for the active application. Click on it to continue your activity. Other features of Handoff include the Universal Clipboard, which makes it easy to share content between devices. 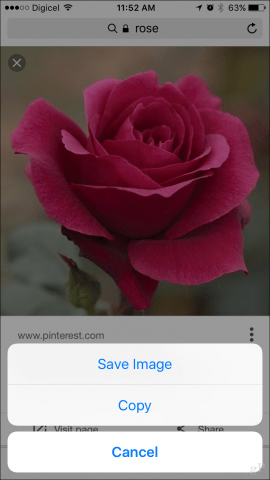 For instance, you can copy and paste a photo on a web page on your iPhone into an application such as Pages. 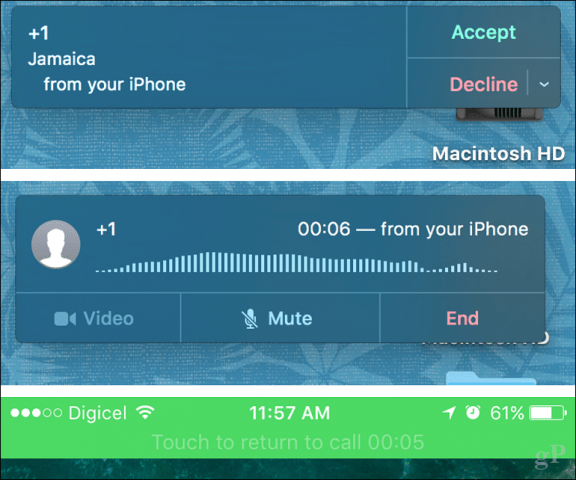 A fun feature I enjoyed using while trying out Handoff was the ability to receive calls from the Mac desktop. There is nothing really to do but accept the call when Handoff is setup. When a call is in session, a green banner will be displayed on your iPhone. You can switch to the iPhone at any time by tapping it. Handoff is not without its share of problems. Initially, I couldn’t get it to work, even after ensuring I had all the necessary pre-requisites in place. It turns out, my issue was due to Bluetooth; it seems the Bluetooth .plist file in Library Preferences was corrupt. Deleting it resolved the problem. Here is how you do that. Open the Finder, click the name of your Mac in the sidebar, open Macintosh HD > Library > Preferences. Select the file com.apple.Bluetooth.plist, right click then Move to Trash. Restarting both your Mac and Apple devices. Make sure macOS and iOS are fully updated. You are running supported device with Bluetooth 4.0 LE or later. For all its merits, Handoff remains hit or miss at times. I found the setup process surprisingly un-Apple like. Troubleshooting could be more transparent. Some users say Continue on PC is a more involved setup process; after trying out Handoff, I would disagree. Once you sign in with your device on Windows 10, it’s pretty much a one time experience. Not to mention, Continue on PC supports both iOS and Android, and only requires Wi-Fi. Handoff could benefit more from third party app support. For instance, apps like Microsoft Word don’t support the feature even though there are macOS and iOS versions of both apps. There is the fact that this is a macOS/iOS exclusive, and I’m sure the number of Apple devices in use by Windows PC users far exceeds those who own a Mac. So, the immediate benefits are not obvious. Either way, it was fun to set up and try out. Share your thoughts in the comments lets us know what you think of this feature.